In LA, Sebastian (Ryan Gosling) is a jazz musician, working a dead-end job playing piano in a bar, but desperate to prove himself as a real force in a music form that many others have given up on. Mia (the brilliant Emma Stone) is a young woman who works as a waitress, but she also goes to a succession of auditions for movie and TV roles in the hope of finding success as an actress. They literally bump into each other at the moment Sebastian is fired from his job. I’s not exactly love at first sight though, despite Mia being enchanted by Sebastian’s music. However, they keep meeting and slowly fall for one another. But while they find love, they have to face the fact they both have artistic passions that demand dedication and sacrifices, and that they may eventually have to choose between their relationship and professional success. 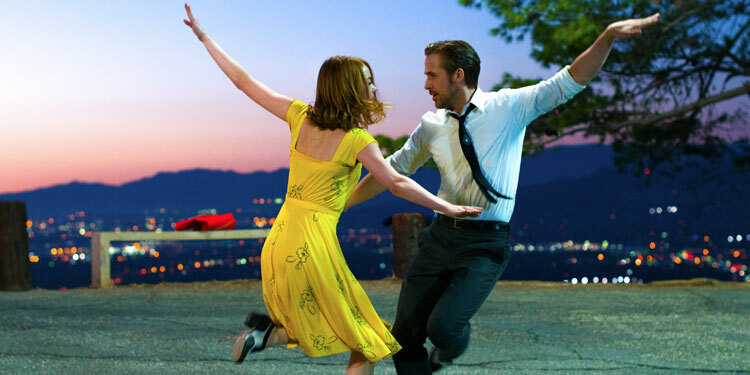 From the bare bones of that plotline it doesn’t sound like anything special, but the whole experience is heightened by some great songs – including the Oscar-winning ‘City Of Stars’ and the wonderful ‘Audition (The Fools Who Dream) – and a style the moves from the realistic to the fantastical in an often mesmerising way. It also has a massive passion for the movies, consciously harking back to the musicals of the 1950s, with director Damien Chazelle demonstrating a real understanding of how cinematic musical magic can transport audiences in ways it’s difficult for other art forms to match. That love of film probably helped La La Land become the favourite for the Oscars, because Tinsel Town undoubtedly love movies about movies. However, it’s certainly found a lot of deserved love with other people too. Interestingly, I’ve spoken to quite a few people who say they don’t like musicals, but who really enjoyed La La Land. It is perhaps because some musicals are so flighty and random, that they’ve tarnished the whole genre for some. However, La La Land is a proper movie, and uses the music to create emotion, romance and wonder. That said, what really makes it stand out is the beginning and the end, create incredible bookends that make La La Land far more memorable than it would otherwise be. The film opens with an astonishing faux-single shot musical number on an LA freeway, where the traffic jam erupts into Technicolor song and dance, allowing the people in (and soon out of) the cars express their dreams and aspirations. It’s a real tour-de-force and certainly pulls the audience into the movie’s world very quickly, with both its technical virtuosity and its joy. While saying too much about the ending would take us into spoiler territory, it’s absolutely beautifully done, and manages to be in turns surprising, emotional and genuinely clever. It also manages to leave the audience thinking, presenting a rare situation where film acknowledges that life choices aren’t generally between good and bad, but can end up taking your life in a completely different direction, where you may miss out on some things, but you could be more fulfilled in others. The middle of the movie is also good, and some of the musical numbers are truly great, but without the brilliance of the beginning and end, it would probably have been a good but not particularly noticed movie, instead of a multi-Oscar winner that’s grossed over $400 million around the world. As with Whiplash though, it shows director Damien Chazelle really is an impressive talent, and one who deserves his Oscar. With the Blu-ray featuring great visuals that make the moment of bright primary colours really pop, and some pretty good special features, it’s a good disc for a very good film. Overall Verdict: A love letter to LA and the Hollywood of the past, which conjures up romance and occasionally wonder – helped by a superb beginning and end. Mr. Issac, i trust you have an opinion on the very question your teaser headline posed. Why not divulge it?! ?